Volkswagen is being engulfed by a growing crisis over its attempt to make millions of diesel cars appear cleaner than they are. "Now it looks like it's becoming a very global issue. It really will be bad for the reputation of the company for a couple of years, it will take time to rebuild the trust of the customers," said Klaus Breitenbach, automotive analyst at Baader Bank. "It's really worrying for the company and also for the whole industry." Volkswagen, which also owns the Audi and Porsche brands, overtook Toyota (TM) earlier this year to become the world's biggest automaker by vehicle sales. "It is premature to comment on whether any specific immediate surveillance measures are also necessary in Europe and [on] the implications for vehicles sold by Volkswagen in Europe," said a spokesperson for the European Commission. "But let me be clear: We need to get to the bottom of this. For the sake of our consumers and the environment, we need certainty that the industry scrupulously respects emissions limits." South Korea said it would investigate whether four VW and Audi models were meeting emissions standards. 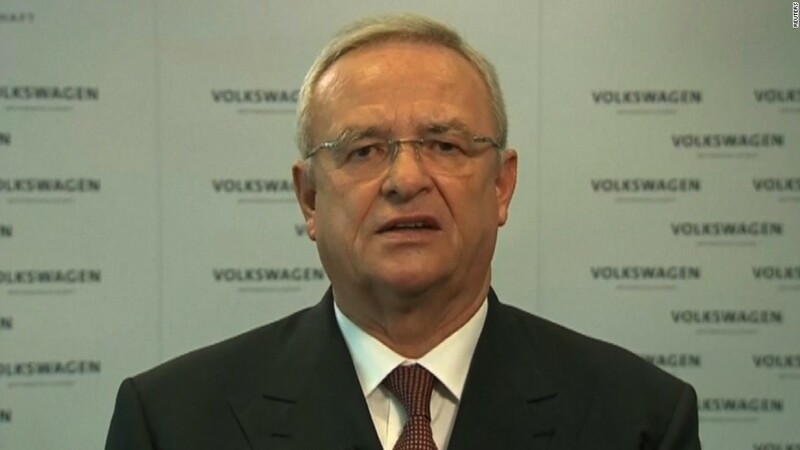 Apart from the financial damage -- Volkswagen could in theory face fines of up to $18 billion in the U.S. alone -- the company could lose its CEO over the affair. Winterkorn, who survived an attempt to remove him earlier this year, made his first apology to customers on Sunday for breaking their trust. On Tuesday, he said the company couldn't yet explain what went wrong but was working hard to find out. And he appealed to employees for their support. "I am personally asking you for your trust as we move forward," he said in a video statement. Michael Horn, the head of Volkswagen in the U.S., admitted that the company had "totally screwed up." "Let's be clear about this, our company was dishonest with the [Environmental Protection Agency], and the California air resources board, and with all of you," Horn said. The scandal dragged down shares in other carmakers on fear the fallout could affect the wider industry. Daimler (DDAIF), the maker of Mercedes-Benz, fell 7%, while BMW (BAMXY) lost 6%. Both companies said the issue is not affecting their cars. -- CNN's Chris Liakos, Zahra Ullah and Stephanie Halasz contributed to this article.